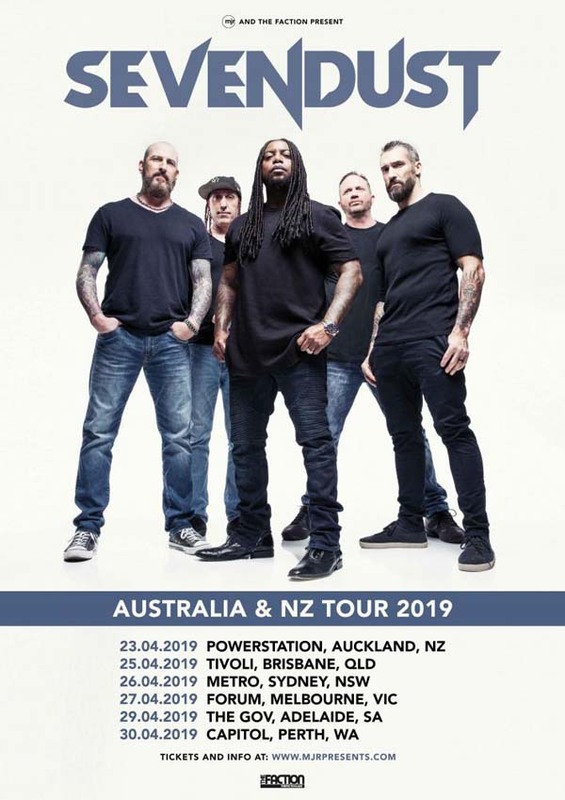 The legendary Sevendust returns to Australia and New Zealand in April! Sevendust are coming to celebrate their 2018 release All I See Is War - a record that has energised fans all over the world. Guitarist for the band, Clint Lowery, says of their extremely dedicated fanbase - "We take pride in the connection we have - We’ve always been a people’s band. We’re typical guys who just happen to make a career on stage. With this relationship to the fans, we realize how much we need each other, so we push ourselves to deliver. We don’t stop. We keep moving." Sevendust first forged a familial tie amongst each other in 1994 that translated into one of the most die-hard audiences in the game. To this day, the connection between fans and the hard rock outfit only grows stronger. For their twelfth full-length All I See Is War, the quintet did the best thing they could possibly do to combat all of the division in the streets and on social media; they went and made a Sevendust record - just bigger, ballsier, and bolder than before - and they couldn't be more excited to bring it to Australia and New Zealand. A trifecta of now-classic gold albums - Sevendust , Home , and Animosity  - ignited their journey. Known as an equally intense and unforgettable live force, they’ve consistently packed houses around the world and decimated stages everywhere from Rock on the Range and Woodstock to OZZfest and Shiprocked! 2015’s Kill the Flaw represented a high watermark. Bowing at #13 on the Billboard Top 200, it scored their highest debut on the respective chart since 2010 and marked their fifth consecutive Top 10 on the Top Rock Albums Chart and third straight Top 3 on the Hard Rock Albums Chart. Most impressively, the lead single Thank You garnered a nomination in the category of "Best Metal Performance" at the 2016 GRAMMY® Awards, a career first. All I See Is War represents yet another new beginning and new point of connection for fans.